Last week we discussed the value and benefits of dramatic play in a child’s life. easy, fast and wonderful dramatic play can be. We arrived home and entered the garage. 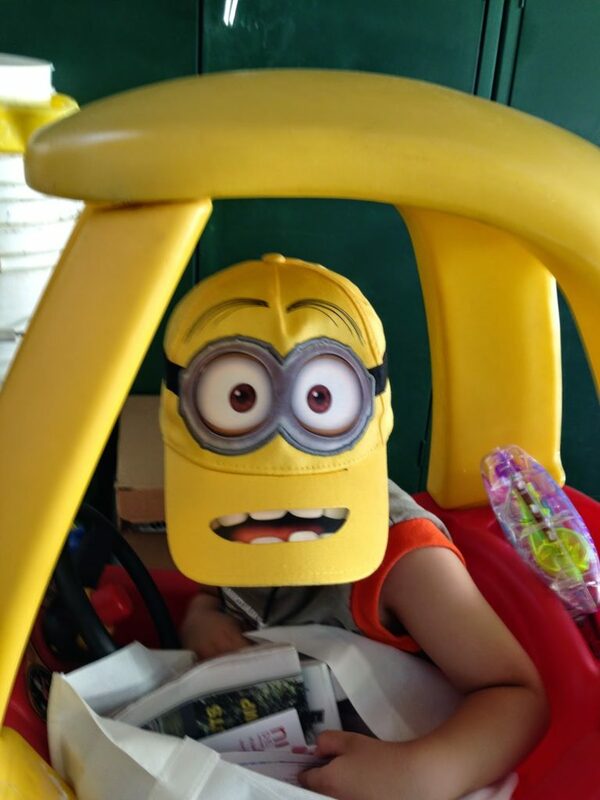 My grandson noticed the Little Tikes car and wanted to go for a spin. (a tricycle or any riding toy would work for this activity). The car was stored in a cardboard box laying on its side that served as the car’s “garage”. 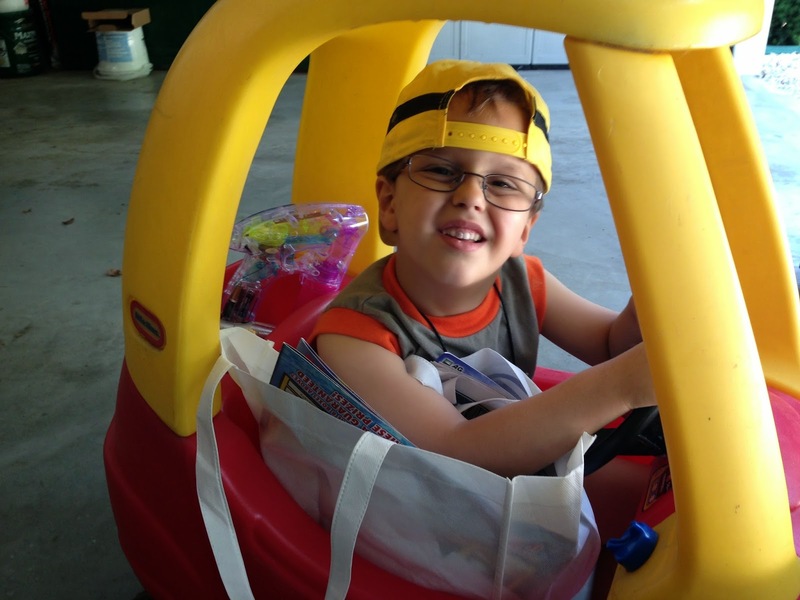 As my grandson drove in circles around the inside of the garage, the wheels in my head began to turn. I grabbed a cloth shopping bag from my vehicle, a handful of junk mail( including the envelopes) from the recycle bin and several empty card board boxes that were headed to the trash. There was a stack of plastic five gallon buckets in one corner which I set around the garage upside down. On the top of each bucket I placed an empty cardboard box with the opening toward the center of the garage. 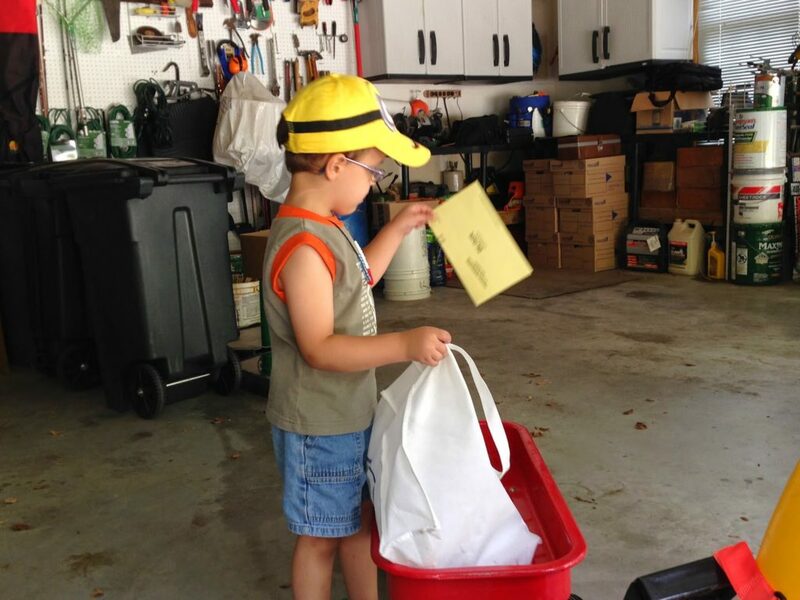 The fabric shopping bag was filled with junk mail and handed to my grandson. I told him he could deliver the mail and be a postal carrier! 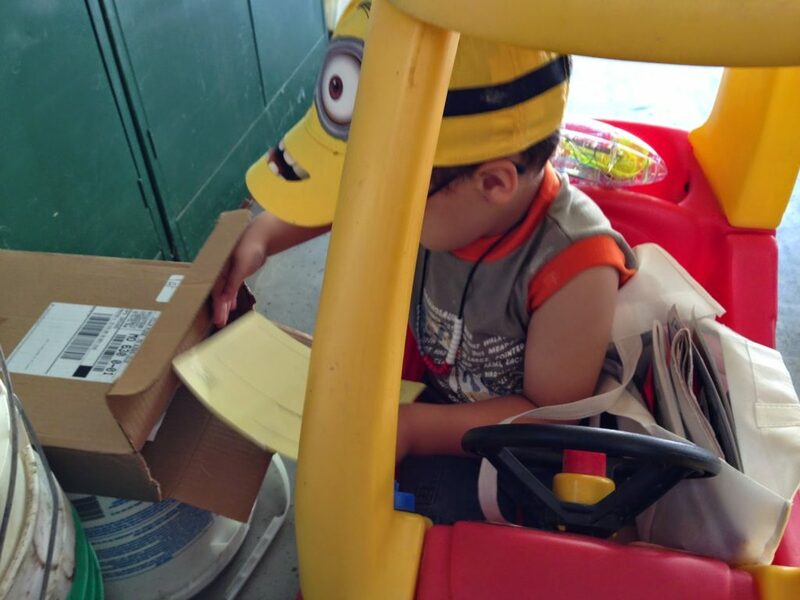 At first he needed some verbal suggestions of ideas as he drove around and placed mail in the boxes. He headed back to the post office bay (the “garage”) to gather more mail. After backing his vehicle into the “post office bay”, he was encouraged to go back out to pick up the mail the people had placed in their mailboxes. He drove around again and picked up all the outgoing mail. Pretty soon he got the hang of the routine of a postal carrier and the real play began. In fact, he proceeded to play for the next several hours. He stopped to wash his car, repair the wheels and hooked it up to a wagon to carry more mail. The play just continued to grow. I listened and watched for ideas as he played and just kept adding props to his role play following his lead. It was great! You could also add a counter for the mail clerk or postmaster. Stamps, stickers, ink pads, tape, calculator, scale etc. could be added for an extension of this play. A hanging shoe bag could be hung for the postal carrier to sort mail etc. What else can you think of? Take a look around your house, watch and listen to your children. What dramatic play can you come up with?